William Fleurimont, 20, and Ali Jean, 23, both from Boston, were arrested on Massachusetts Felony Assault Charges, as well as Drug Charges, in connection with the stabbing of an East Bridgewater man. Following a high-speed chase than ended in Hanson, Fleurimont and Jean were both arrested and charged in Brockton District Court with Assault with Intent to Murder, Armed Robbery, Unlawful Possession with Intent to Distribute Drugs, Conspiracy to Violate Massachusetts Drug Laws, and various Motor Vehicle Charges. According to the East Bridgewater Police Department, officers received a report of a person stabbed, as well as a description of a black SUV. The black car was spotted and stopped by other officers, but the driver, Ali Jean, allegedly then took off when he was ordered to get out of the car. Ali Jean then allegedly led police on a chase into nearby Hanson, which ended when the SUV crashed into a tree, but not before Ali Jean and Williams Fleurimont got out of the car and allegedly ran. 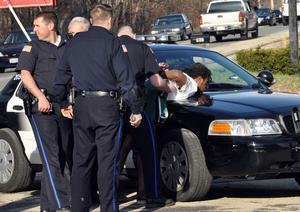 Both were eventually found and arrested by East Bridgewater Police officers less than an hour later. The East Bridgewater Police have indicated that the alleged stabbing incident allegedly involving Jean and Fleurimont was drug-related, and both purportedly knew the stabbing victim. Boston Criminal Defense Attorney Lefteris K. Travayiakis is available 24/7 for consultation on all Massachusetts Crimes of Violence Charges and Drug Crimes Charges.